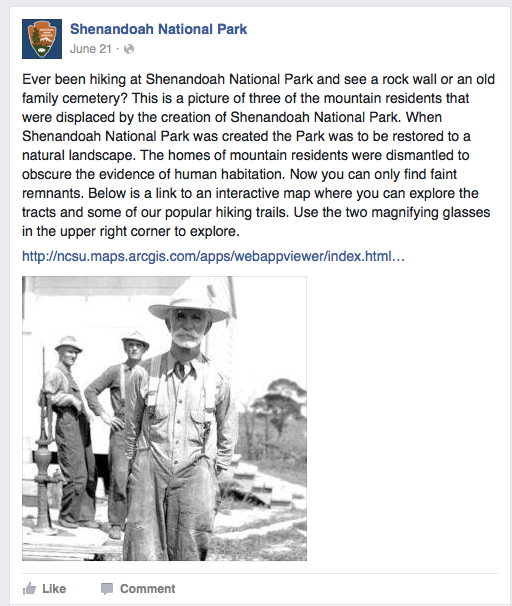 In June, Shenandoah National Park’s Facebook page introduced the web app developed at NC State by center students and researchers. 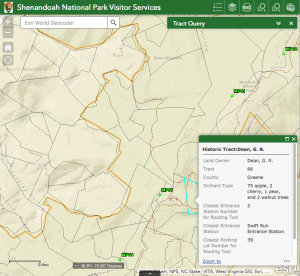 A web app collaboratively developed by the center and the National Park Service (NPS) is connecting the modern world with Shenandoah’s past. “Exploring Park History – One Tract at a Time” is an interactive web-based mapping application that allows viewers to discover land parcels occupied before the park was established and to learn about the families who lived there. The app is just one example of the innovative work emerging from partnerships developed through the professional master’s program (MGIST) capstone course and the creative combination of center research and academic programs. 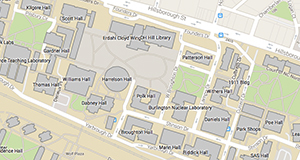 MGIST students developed the app with NPS over several semesters under the guidance of Charlynne Smith, who teaches the capstone course, and Bill Slocumb, a center research practitioner and coordinator of the NPS’s GIS Research, Development & Technical Support Center for the Northeast Region. The web app allows users to discover who lived in the area now occupied by Shenandoah National Park. For example, several adjacent properties on park’s western border were occupied by the Dean family, namesakes of Dean Mountain. Tract details show that the Deans planted many fruiting trees. When the Exploring Park History app launched this past June, “the initial Facebook response was amazing,” reports Dan Hurlbert, GIS Specialist at Shenandoah National Park, “with nearly 99,433 people reached, 1100 likes and 348 shares.” The app allows users to search tracts by family name, view hiking trails, and find amenities in the park. Since going live, the application has been viewed over 3,000 times. “As part of our NPS program and MGIST capstone course, I anticipate working with Shenandoah NP to enhance this application,” Bill explains. Multimedia document sets in the form of public records, historic family photos, and correspondence may soon accompany the current tract information in upcoming semesters and further enrich app users’ experience.